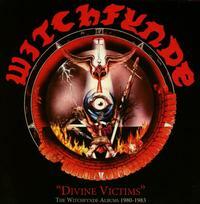 You could sort of think of Witchfynde as one of the underappreciated bands of the New Wave of British Heavy Metal. This new box set has their first three albums. This shows that they had as much promise and style as Iron Maiden. You can hear these guys improve with each album, too. I like this set quite a bit. It's clearly a great way to get versed in the world of Witchfynde in a hurry. I love the hard rocking riff that starts this thing. It works out from there to a solid NWOBHM jam. The chorus is rather catchy, and the whole tune is just strong. It makes me think of a more metal version of UFO in a lot of ways. What this one lacks in tempo, it more than makes up for in style and magic. There are some exceptional guitar fills, and the whole song is just so cool. I love the guitar solo, too. This has a mellower, almost proggy sound on the early section. It makes me think of early Rush in some ways. That gets reinforced as the song gets more energy and power. Musically, it wouldn't be hard to imagine this as some outtake from Rush's Caress of Steel album. Sure, this gets into more pure NWOBHM sound from there. It's a cool number with a lot of range. In fact, it's one of the most dynamic things here. This is more of a typical rocker. It's quite typical of the early NWOBHM sound. The lyrics lyrically get into screaming territory. I dig the riff driving this a lot. The whole cut just really works well. It's nothing fancy, but it has a tendency to be catchy and has some cool hooks. A bit of a slower metal grind, the first part of this is still quite classy stuff. I like the guitar solo section quite a bit. There is an echoey, trippy spoken section that actually makes me think of Hawkwind a bit. Spacey jamming ensues from there, moving this almost into space rock, emphasizing that Hawkwind reference. They take it into almost proggy territory from there before powering out into some more serious metallic stuff. At just under nine minutes in length, this is the epic of the first disc proper. After the wandering powerhouse that preceded it, this is straightforward no frills metal. This short little bit is strange. It has scratched record sounds and a weird old time music element along with some non-sung vocals. It's just about half a minute long. There is a really progressive rock like quality to this cool number. Sure, it has a bit of a raw metallic edge, but I could definitely see the first movement of this being labeled as prog rock. I love the melodic guitar solo. I will admit that that section of the piece feels a bit like Thin Lizzy to me. The tune works out from there into more pure metal music. The changes continue as it makes it way forward. This one is almost as long as "Unto The Ages of the Ages." This is much more on the raw side than the rest of the set. It isn't all that special. I can see why it was a B-Side. Still, it does have some energy and charm. The metal pounds out right at the start on this album. The music of this isn't a huge change, but there is more crunch and power here than we heard on the first CD. This is the most mainstream thing to this point. It's still set with a metal edge, but this is quite a catchy pop rock song in a lot of ways. It's the most polished sound we've heard to this point, too. Mainstream hard rock meets a metal sound on this thing. It's another classy tune. I like the multiple lines of vocals. The guitar solo is quite meaty, too. The B-Side bonus track from the first disc gets a revisit here. This is much more polished than the earlier version. It's still a bit rawer than the rest of this album, though. All that said, this is a killer metal tune with a lot of power and magic built into it. I like this a lot. That Thin Lizzy element I mentioned on the last CD seems to be back here. This is more good time rock and roll with some metal crunch added to its form. It's a classy song that's just plain fun. The main guitar riff on this is pretty cool. The cut is another that bridges the gap between mainstream hard rock and early heavy metal. This is catchy and classy. The mellower dropped back section has some elements of prog and jazz in the mix. Although not a huge change, this is another solid tune. It has a bit more of that classic NWOBH sound to it. It makes good usage of the balance between mellower and harder rocking stuff. After a bit of a trippy intro, this shifts out to some smoking hot guitar soloing. It's a mid-tempo metal cut. The guitar solo section has some prominent bass sound, but the bass is actually further out front than one expects on this kind of song. That's a good thing as far as I'm concerned. This is more of a power ballad. It's among the more mainstream stuff here. It's also a great tune. This live recording sounds quite good. These guys sound a lot like early Iron Maiden here. It seems that the band really shone in live performance as this has a lot of metal power. Another fierce metal stomper, this is also a killer live performance. The melodic piece is not nearly as effective as the last two were. It doesn't gel as well, and brings down the energy level at the same time. That's a recipe for disaster. It does improve as it gets more crunch, but overall this song is kind of an "also ran." Now, this is more like it. The riffing is strong. The cut has crunch and energy. It's just solid. Special effects and creepy aural chaos starts this. There are sounds of warfare and demonic monsters in the midst. Then that stops and a voice says "welcome to the Devil's playground." There's a blast of metal fury with a scream over top. The cut launches out into some killer NWOBHM. These guys have been improving with every album, and this just plain rocks. I dig the balance between mellower and more rocking stuff on this cut. It's another smoking hot metal tune. This is very classic in nature, really. There is almost a punky Ramones vibe to the riff that opens this cut. It works out with a scream to more typical NWOBHM stuff. This is another powerhouse stomper. While this is not a big change or a stretch, it's a solid tune. This is just an effective metal stomper. The title track is one that balances between mellower and more rocking sounds. This makes me think of Diamond Head quite a bit. A slow metal grind opens this. They take it out into "Hall of the Mountain King" and speed it upward from there. Then a scream heralds a shift to a screaming hot metal jam. There are things about this that make me think of a cross between Judas Priest and Iron Maiden. Again this isn't anything Earth-shattering. It's just another solid early metal tune. The riffing on this is a bit meatier, making this one stand taller than the cut that came before it. Another that sort of falls into the "also ran" category, the guitar solo section stands pretty tall. A pretty typical NWOBHM stomper, this has some intriguing stuff on the instrumental bridge. It gets into some pretty powerhouse stuff in that segment. This short instrumental has some cool melodic guitar work.